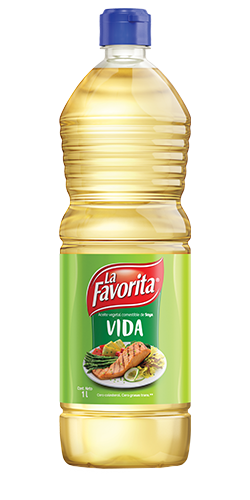 100% vegetable oil fully obtained from a mixture of soy vegetable oil with palm olein, completely refined and cholesterol-free. Cholesterol-free and trans fatty acids-free. Maintains the natural flavor of your meals because of its neutral flavor. For preparing meals at home such as fried foods, salads, and all types of typical Ecuadorian dishes. Versatile product; no limits to its application. 365 ml bottle; 30-unit box. 500 ml bottle; 30-unit box. 1 liter bottle; 15-unit box. 2 liter bottle; 8-unit box. 4 liter bottle; 5-unit box. 100 ml Doypack, 24-unit box. 200 ml Doypack, 24-unit box. Excellent stability to the cold and to temperature changes. Contains essential vegetable fatty acids. Does not contain trans fatty acids or cholesterol. Preparation in salads, sauces, and condiments. For cooking and frying food products and all types of culinary preparations at home. 100% vegetable oil, completely refined, whitened, and deodorized from raw canola oil. Free from cholesterol and trans fatty acids. With the lowest content of saturated fatty acids. Does not contain additives or preservatives. 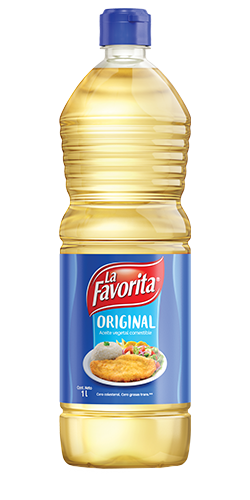 Excellent for use in the preparation of healthy meals such as in mayonnaise, sauces, and dressings. Helps in the delivery of vitamins A, D, and E in our body. Product especially developed to be used as table and cooking oil. 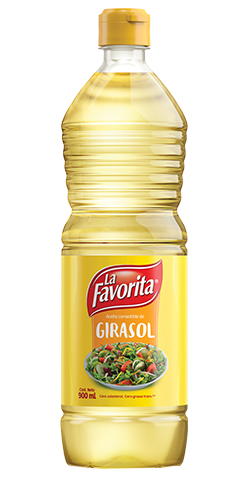 For the preparation of sauces and dressings and as a complement for salads. 100% vegetable oil from raw sunflower oil obtained through combined processes of refining, whitening, and deodorization. High-quality oil, free from toxic substances such as pesticides and polycyclic aromatic hydrocarbons. Especially developed for use as table and cooking oil. For preparation of sauces and dressings, as a complement to salads, and in the preparation of all types of meals in the home. 900 ml PET bottle; 15-unit box. 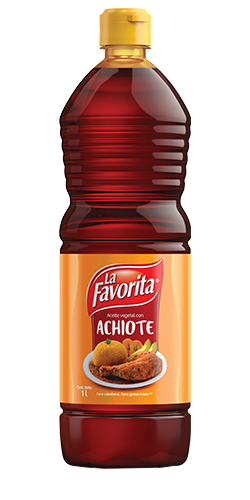 Mixture of soy and palm olein vegetable oil (refined, whitened, and deodorized) with annatto extract (Bixa orellana), with a liquid consistency and a reddish color. Stable color at high cooking temperatures. 100% vegetable extract, free of additives and preservatives. Free of "Trans" fatty acids and cholesterol-free. In the preparation of food products requiring natural coloration and in all types of recipes of culinary use in restaurants and gourmet kitchens. Used as coloring and flavoring in the preparation of local dishes, especially in stews and roasts, sauces, soups, and rice. 25 ml bottle, 25-unit box of 4 displays. 200 ml bottle; 30-unit box.